When you have transfectable cells and want to take advantage of the robust and reliable expression that’s possible from the AAVS1 Safe Harbor Site, SBI offers a streamlined plasmid system that’s ready to go. 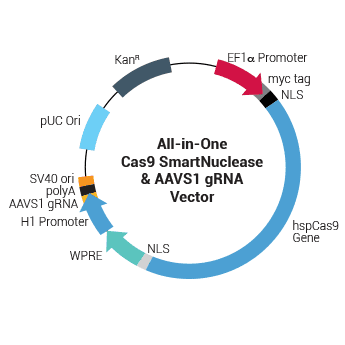 The All-in-one Cas9 SmartNuclease™ & AAVS1 gRNA Plasmid expresses both Cas9 and an AAVS1-targeting gRNA—just co-transfect with a homologous recombination (HR) Targeting Vector and select for your desired colonies. Note that we’ve specially designed a series of AAVS1 HR Targeting Vectors that greatly reduce off-target integration events (Cat.# GE620A-1, GE622A-1, and GE624A-1). Taking advantage of the AAVS1’s location within an intron, these vectors come with a puromycin marker that has no promoter, only a splice acceptor site—expression of puromycin can only occur when the construct integrates within an intron, reducing the probability of recovering off-target integrants in the presence of puromycin selection. As with all of our Cas9 delivery options, the All-in-one Cas9 SmartNuclease & AAVS1 gRNA Plasmid is functionally validated and comes backed by our expert technical support team—if you’ve got a genome engineering question just ask by emailing tech@systembio.com.